Lola has a gorgeous older male pup. What a whirlwind of a show career Lola had, first time in the ring she won a Major Reserve during the very competitive January circuit. Then the next 2 weekends won 3 majors getting a Toy Group 2 and 3. She finished April 12th while still in the 6-9 mo puppy class, getting her 4th major and then went on to a Puppy Group 2. 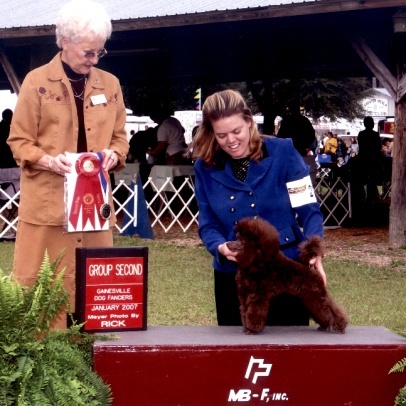 While her show career was short and sweet, she was #6 Toy Poodle all breeds from the classes. Lola above going Group 2.